Taste and Truth: Such Stubborn Hearts! 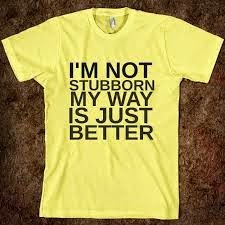 We have such stubborn hearts! I was so reminded of this when reading Jeremiah 40-44. God's people have been captured and taken to Babylon. It's been long coming. The Lord is using Babylon as a weapon to punish His people for their wickedness. The Lord's prophet Jeremiah is left behind, along with a remnant to tend the land. This remnant of God's people are being governed by Gedaliah, one of their own, appointed by the Babylonians. Another guy decided to seize control, turmoil ensued. Both Gedaliah and the usurper are killed in the process. Johanan is now the ruler, and he wants to save the people. Recognizing (finally!) that God is who He says He is and that Jeremiah is in line with the Lord, Johanan and the people ask Jeremiah to pray for them. They want him to ask God if they should flee the land in fear of Babylon or stay where the Babylonians left them and trust him. The people say -yes, they say- that regardless of the Lord's response, they will obey Him. His might has been displayed, they know it's useless to disobey Him. So, God replies after ten days through Jeremiah. He wants them to stay in the promised land where they were left. God promises to deliver and protect His remnant. The same people who just said they'd obey God regardless of His response (and His response was in their favor!) flee. They flee because they are afraid of Babylon. Moreso, they flee because they decide that Jeremiah is trying to trick them. This is how stubborn our hearts are! We witness the Lord's work, we go to God and surrender, we vow to obey Him and perhaps we mean it. But as He responds we don't trust His Word. We twist it, defiling it with worldly assumptions, and we still do things our own way. If you keep reading, or read any of Scripture leading up to these passages, you'll find more of the same. God works on behalf of His people, they recognize Him and proclaim their allegiance. Then, their stubborn hearts follow temptations, trust in deception, and fear immediate threats rather than the promises of the Lord. And this isn't just the story of the Israelites. This is each of us. How often do we go to God with a question and get impatient when He doesn't give an immediate answer? How often to do we doubt His responses, choosing to fear the potential of evil deceit than to trust those who seek Him will not be left wanting? How often do we surrender to Him and then go our own way anyway, with some excuse or another? Our hearts are so stubborn! And God knows that. Scripture tells us that the Lord's target is our heart. He knows it to be our personhood and the center of all of our operations because He made it (Proverbs 4:23). When the Spirit transforms us, in starts in our hearts (Ezekiel 36:26). It is on our hearts, not on tablets of stone, that the Spirit writes the truth (2 Corinthians 3:3). David knew a lot about the heart and how stubborn it can be. His prayer can be our prayer, because Lord knows we need to surrender first and foremost to Him that which all this stubbornness originates in.